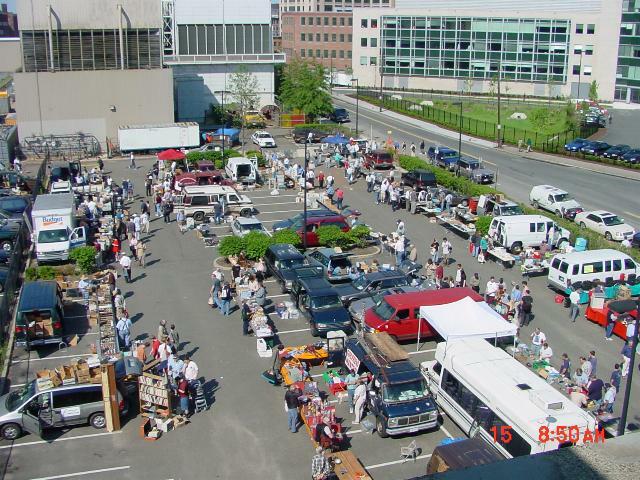 MIT Flea Market or Swapfest. Where can you get an amazing deal on a used PC or electronic doodads on the third Sunday of the warmish months? At MIT’s legendary flea market or swapfest. At MITFlea.com, you can get the scoop on buying or selling electronics, amateur radio components, and computers a few years old with plenty of juice left for most users. And deals are to be had. The Boston Globe reports August deals of a $250 Dell Latitude laptop with an Intel Pentium 4 chip, a gig of RAM, and a 40-gigabyte hard drive or, for $300, a Hewlett-Packard laptop with a 14-inch screen, an Intel dual-core Centrino processor, a gig of RAM, and an 80-gig hard drive. Who sponsors this? The MIT Radio Society, in conjunction with the MIT UHF Repeater Association, the MIT Electronics Research Society, and the Harvard Wireless Club, hosts the swapfest on the third Sunday of each month, April through October, at the Albany Street garage on the corner of Albany and Portland streets. Next date: Sept. 20. 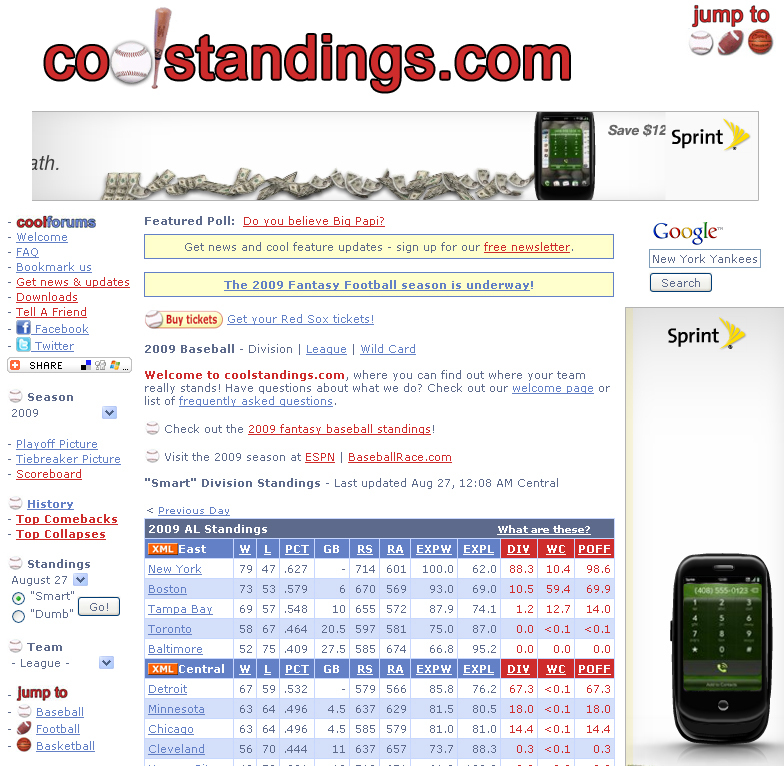 Coolstandings.com: Know Where Your Team Really Stands! Your team is six games back in August…What are their realistic chances of winning the division, winning the wildcard, or just making the playoffs? A couple of MIT alumni can help you there. Theta Chi buddies Greg Agami ’93 and Sean Walsh’93 started coolstandings.com in 2005 when these Red Sox fans thought it would be fun to know exactly what chances the Sox had of making the postseason. Within a few months, coolstandings.com was online, simulating the remainder of the MLB season one million times each day to determine the playoff probabilities for every team. These days, you can follow football and basketball as well as baseball in the real season and a fantasy pre-season. And this is not even their day jobs—Agami is an engineer at Motorola, while Walsh is CTO at DestinationWeddings.com. Chef Gavin Kaysen sauces a dish of Magret de Canard at Cafe Boulud in New York. (© Owen Franken). MIT has been called the center of a lot of things. In the 1970s, the New York Times recalled its history as a center of military research. The Chicago Tribune speculated about it being the next center of economic thought in the 80s, and in the 90s, another Times article referenced it as the center of computer science. Nobody ever mentioned that MIT was also once the center of winking, until recently. An interview in the San Diego Reader with alumnus Rick Tucker ’80 reveals that MIT was considered the center of winking, or tiddlywinking, about 35 years ago. And if all this talk about Tiddlywinks has you itching to play some yourself, check out game prices on Amazon or eBay. Keep your eyes peeled for MIT’s contribution—a real-time carbon counter, developed by the Institute’s Global Climate Change Program and the National Oceanic and Atmospheric Administration. Other highlights on the list include a foot pump phone charger from the UK, and solar powered air purifiers from Singapore. Sometimes seemingly simple inventions can make the most impact. A team of MIT undergrads proved this with their 6dot Braille Labeler, a label maker for the blind that replaces current error-prone, clunky systems with an intuitive and reliable design. The instrument is a lifesaver for individuals who rely on Braille to differentiate among pill bottles, for example, or CDs or paperwork. The device won the nation’s People’s Choice Award from a public vote in the James Dyson Award competition. The contest encourages and inspires the next generation of design engineers from 21 countries with a simple challenge: design something that solves a problem. Watch the labeler in action below and learn more about the product. The team, supported by Course 6 Senior Lecturer Christopher Terman SM ’78, EE ’78, PhD ’83, advanced to the first round of shortlisted inventions, but did not make it to the next round of 20 finalists. However, they do have two prototypes, developed a business plan, filed a provisional patent, and have met with potential manufacturers. The overall winner of £10,000 each for the designer and his or her school will be announced next month.